Lodge & Cabin Rugs, perfect for decorating the floor of your cabin, man cave, lake house, hunting hideaway, or lodge themed room! We have moose, deer, fish, pine cones, elk, bear, wolf, and more! 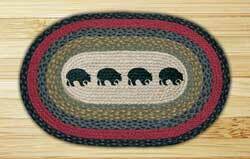 Baby Bear Oval Patch Braided Rug, by Capitol Earth Rugs. Measures 20 x 30 inches. Made of 100% natural jute. Measures 24 x 36 inches (2 x 3 feet). 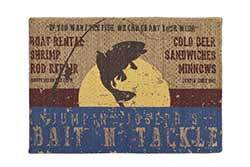 Perfect for a cabin, man cave, or fishing decor! 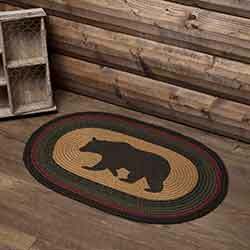 Perfect for a the rustic cabin look, this braided rug features a printed black bear image and vintage lodge resort lettering, in a color palette of oatmeal, burgundy, black, and brown. 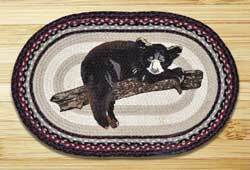 Black Bears Oval Patch Braided Rug, by Capitol Earth Rugs. Measures 20 x 30 inches. Made of 100% natural jute. 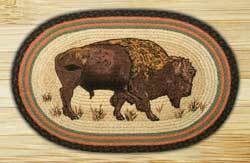 Buffalo Oval Patch Braided Rug, by Capitol Earth Rugs. Artwork designed by Harry W. Smith. Measures 20 x 30 inches. Made of 100% natural jute. 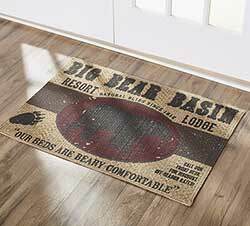 Cabin Bear Braided Jute Rug, by Capitol Earth Rugs. Jute is a natural fiber, considered to be a sustainable, environmentally friendly material. Water repellant, safe to put near a fireplace, spot clean with soap and water (or dry clean). 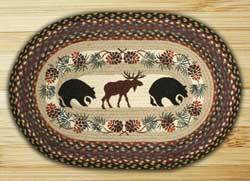 This is for the Cabin Bear Braided Round Rug, which features stenciled artwork of a black bear and braiding in green, burgundy, brown, and creme. Designed by Sandy Clough. Measures 27 inches. As with all dyed jute products, take care to use a pad or otherwise protect items used with them, as colorfastness can be an issue. 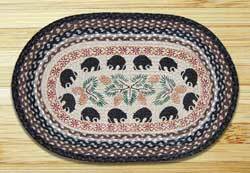 Cabin Bear Oval Patch Braided Rug, by Capitol Earth Rugs. Artwork designed by Sandy Clough. Measures 20 x 30 inches. Made of 100% natural jute. 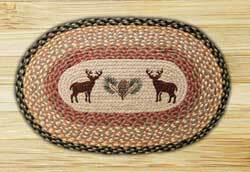 Deer & Pinecone Braided Jute Rug, by Capitol Earth Rugs. 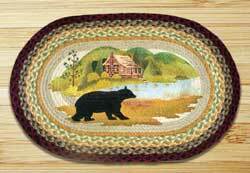 Features stenciled designs of black bears and pine sprig, with braiding in mainly burgundy, black, and tan. Measures approx 20 x 30 inches. Jute is a natural fiber, considered to be a sustainable, environmentally friendly material. Water repellant, safe to put near a fireplace, spot clean with soap and water (or dry clean). As with all dyed jute products, take care to use a pad or otherwise protect items used with them, as colorfastness can be an issue. 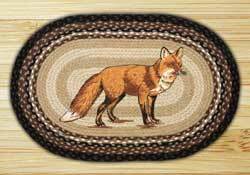 Fox Oval Patch Braided Rug, by Capitol Earth Rugs. Artwork designed by Harry W. Smith. Measures 20 x 30 inches. Made of 100% natural jute. 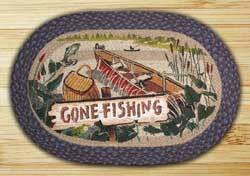 Gone Fishing Oval Patch Braided Rug, by Capitol Earth Rugs. Artwork designed by Phyllis Stevens. Measures 20 x 30 inches. Made of 100% natural jute. Moose & Pinecone Braided Jute Rug, by Capitol Earth Rugs. Features stenciled designs of moose and pinecone sprigs, with braiding in red, black, sage, and cream. Measures approx 20 x 30 inches. Jute is a natural fiber, considered to be a sustainable, environmentally friendly material. Water repellant, safe to put near a fireplace, spot clean with soap and water (or dry clean). As with all dyed jute products, take care to use a pad or otherwise protect items used with them, as colorfastness can be an issue. 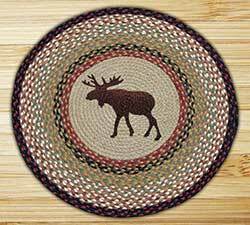 Moose Braided Jute Round Rug, by Capitol Earth Rugs. Jute is a natural fiber, considered to be a sustainable, environmentally friendly material. Water repellant, safe to put near a fireplace, spot clean with soap and water (or dry clean). 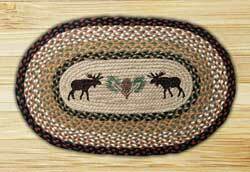 This is for the Moose Braided Round Rug, which features stenciled artwork of a moose and braiding in red, blak, creme, natural tan, green, and gold. Measures 27 inches. As with all dyed jute products, take care to use a pad or otherwise protect items used with them, as colorfastness can be an issue. Pine Welcome Braided Jute Rug, by Capitol Earth Rugs. Features stenciled designs of pine sprigs and "Welcome," with braiding in green, tan, and burgundy. Measures approx 20 x 30 inches. Jute is a natural fiber, considered to be a sustainable, environmentally friendly material. Water repellant, safe to put near a fireplace, spot clean with soap and water (or dry clean). Pinecone Red Berry Braided Jute Rug, by Capitol Earth Rugs. Jute is a natural fiber, considered to be a sustainable, environmentally friendly material. Water repellent, safe to put near a fireplace, spot clean with soap and water (or dry clean). 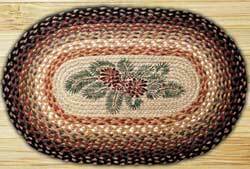 This is for the Pinecone Red Berry Braided Jute Rug, which features stenciled artwork of pine sprigs and cones. Measures 20 x 30 inches. As with all dyed jute products, take care to use a pad or otherwise protect items used with them, as colorfastness can be an issue. 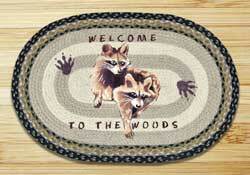 Raccoon Welcome Braided Jute Rug, by Capitol Earth Rugs. Jute is a natural fiber, considered to be a sustainable, environmentally friendly material. Water repellent, safe to put near a fireplace, spot clean with soap and water (or dry clean). 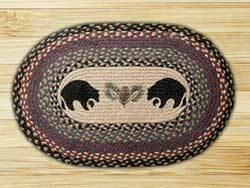 This is for the Raccoon Welcome Braided Jute Rug, which features stenciled artwork of raccoons and their paw prints, and welcome text. Licensed artwork by Jan Harless. Measures 20 x 30 inches. As with all dyed jute products, take care to use a pad or otherwise protect items used with them, as colorfastness can be an issue. 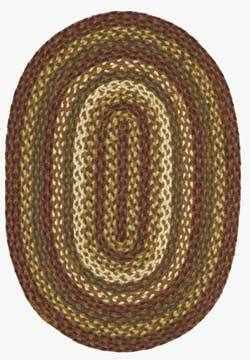 Tea Cabin Jute Oval Rug, by Nancy's Nook. Features a palette of green, red, creme, and tan. Measures 20 x 30 inches. Jute is a natural fiber, considered to be a sustainable, environmentally friendly material. The jute is first dyed, then hand-constructed into braided accessories. Other sizes and matching items also available! Tea Cabin Jute Oval Rug, by Nancy's Nook. Features a palette of green, red, creme, and tan. Measures 24 x 36 inches. Jute is a natural fiber, considered to be a sustainable, environmentally friendly material. The jute is first dyed, then hand-constructed into braided accessories. Other sizes and matching items also available! Tea Cabin Jute Rug, by Lasting Impressions. Jute is a natural fiber, considered to be a sustainable, environmentally friendly material. The jute is first dyed, then hand-constructed into braided accessories. This is for the Tea Cabin Oval Jute Rug, in the Large Sizes, that are considered special order (no returns). Features a palette of green, red, creme, and tan. Sizes are: 27 x 48 inch, 22 x 72 inch, 27 x 60 inch, 27 x 72 inch, 3 x 5 foot, 4 x 6 foot, 5 x 8 foot, 6 x 9 foot, 8 x 11 foot. Trout Braided Jute Rug, by Capitol Earth Rugs. Jute is a natural fiber, considered to be a sustainable, environmentally friendly material. Water repellent, safe to put near a fireplace, spot clean with soap and water (or dry clean). 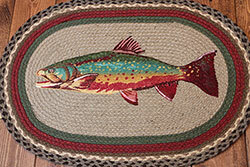 This is for the Trout Braided Jute Rug, which features stenciled artwork of a colorful trout fish. Designed by artist Harry Smith. Measures 20 x 30 inches. As with all dyed jute products, take care to use a pad or otherwise protect items used with them, as colorfastness can be an issue. Welcome Loons Braided Jute Rug, by Capitol Earth Rugs. 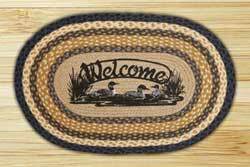 Features stenciled designs of loons in a pond with "Welcome," with braiding in blue, dark blue, mustard, and cream. An R.A. Guthrie design. Measures approx 20 x 30 inches. Jute is a natural fiber, considered to be a sustainable, environmentally friendly material. Water repellant, safe to put near a fireplace, spot clean with soap and water (or dry clean). As with all dyed jute products, take care to use a pad or otherwise protect items used with them, as colorfastness can be an issue. Welcome friends and family to your home with an eye-catching coir mat! 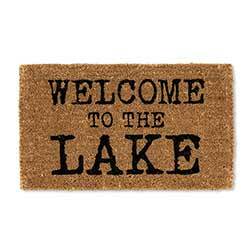 This one features a simple message and classic look, with lettering reading "Welcome to the Lake" in black against a natural tan background. 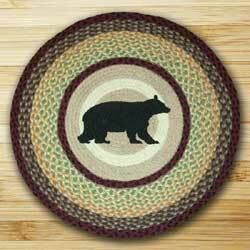 Answer the call of the wild with the rugged but stylish Wyatt Bear Braided Half Circle Rug. An icon of American timberlands, a bear is stenciled in the center over solid dark tan. 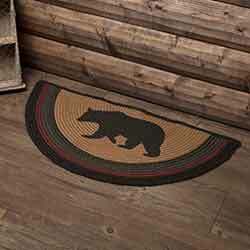 Answer the call of the wild with the rugged but stylish Wyatt Bear Braided Rug. An icon of American timberlands, a bear is stenciled in the center over solid dark tan.